Last week, we reported the domain registration scam by DomainRegister. Now, a week later, another one has popped up, this time by Domain Name Group. An example of their letter with payment options is included below. It looks extremely similar to the one from DomainRegister. 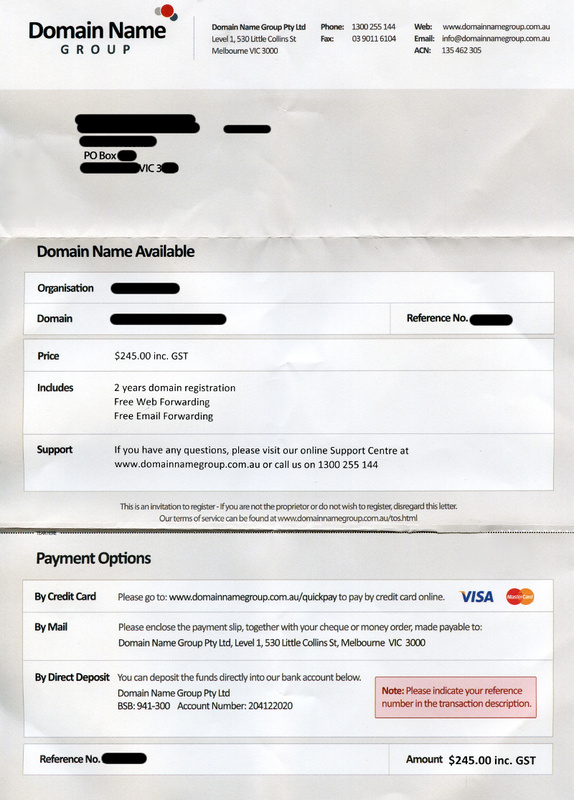 Domain Name Group with their unsolicited invitation to register a domain name at a high price, which very closely resembles a bill for a service that you should pay. They attempt to get you to register an additional domain which is quite similar to one of your existing domain names. For example, it may be a .com or .net.au version of a .com.au domain you already own. The offer to register is aimed at either convincing you that you are simply renewing your existing domain, or that you should register the similar name to protect your internet identity. They push the legal boundaries of billing you for something you didn’t order by the use of wording that says “this is an invitation to register – if you are not the proprietor or do not wish to register, disregard this letter”. The registration fee is very excessive, typically several hundreds of dollars, which is up to 10 times the amount of an equivalent service provided by a reputable provider. The offer of free web or email forwarding does not offset the large total of the bill. Before deciding to renew your existing domain, or registering a similar domain to one you already own, you should definitely look around for the best deal. But most importantly, ensure that your selected domain registrar has been accredited by auDA – the Australian domain name administrator. See the official list of accredited domain registrars and then visit each registrar’s website to compare their domain name pricing. auDA posted out a warning two years ago about the ongoing unsolicited letters to businesses from Domain Name Group and Domain Register. If you have registered an internet domain for your website, you may be the target of scams by other domain registrars who may employ a number of procedures to trick you into registering additional similar domains at inflated prices. These organisations are able to find out your contact details, as the registered domain owner, by consulting the Whois Database. They then post you out an official looking letter in the mail which may closely resemble an invoice to be paid. 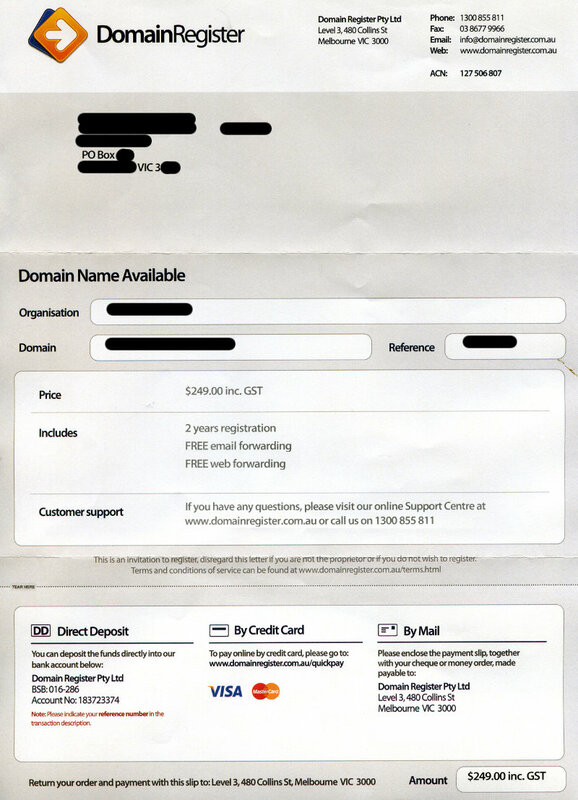 Domain Register Pty Ltd with their unsolicited invitation to register a domain at a very inflated price, which closely resembles a bill for a service that you should pay. They are trying to get you to register an additional domain which is very similar to one of your existing domain names. For example, it may be a .com or .net.au version of a .com.au domain. The offer to register is aimed at either convincing you that you are in fact renewing your existing domain, or that you should register the similar name to protect your internet identity. They push the legal boundaries of billing you for something you didn’t order by the use of headers and wording that includes “domain name available” and “this is an invitation to register”. The registration prices are very excessive, typically several hundreds of dollars or up to 10 times the amount of an equivalent service provided by a reputable provider. Any offers for free gifts or bundled in services do not offset the large total of the bill. Before deciding to renew your existing domain, or registering a similar domain to one you already own, you should shop around for the best deal and ensure that your selected domain registrar has been accredited by auDA – the Australian domain name administrator. See the official list of accredited domain registrars and visit each registrar’s website to compare domain name pricing. Two years ago, auDA posted out a warning about the ongoing unsolicited letters being sent out by Domain Name Group and Domain Register.